Much to my delight, young summer squash are now popping up in gardens, farmers markets, and roadside stands across Ontario. Crooknecks, cocozelles, black beauties, sun drops and butter blossoms to name a few. But my favorite, just by virtue of its spaceship-shape alone, is the patty pan. However mother nature came up with such a kooky-looking veggie is beyond me, but inside its eccentric exterior is a soft, tender flesh that is deliciously mild and happily familiar. I pulled this meal together from several different places in my back country meanderings. I picked the kale from a friend’s garden, squash from a farm stand, peas and garlic from the market – a journey in a meal I’d like to say. Eating in the summer and having some kind of connection or memory tied to the ingredients in a dish brings me more pleasure than almost anything else. I love looking down a plate full of stories. 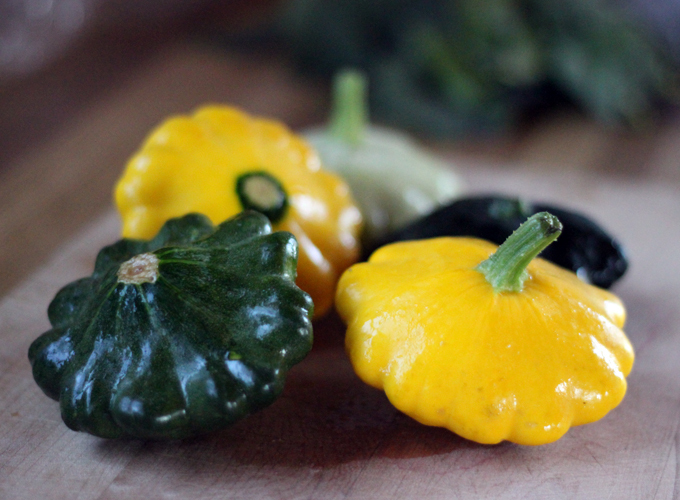 For a long time, I called patty pan squash Peter pans. I was also six. I can’t recall if this was a sneaky way for my parents to entice me into eating one of the peculiar-looking vegetables or just my own imagination, but either way, I was more interested in playing with them than eating them. They made seriously great UFOs and hats for stuffed animals in a pinch. Aside from their endless source of non-edible entertainment value, summer squash is also an excellent source of manganese and vitamin C, and a very good source of magnesium, vitamin A (notably through its concentration of carotenoids, including beta-carotene). They contain good amounts of fiber, potassium, folate, copper, riboflavin, and phosphorus too. These stuffed summer squash are an elegant start to any meal, or eat a couple with a side of greens for a complete dinner. The filling is absolutely delicious and could easily make a meal of itself without even going near the inside of a patty pan. Try it on its own if you so desire – it’s tasty hold or cold. The caraway seeds, although a last-minute addition, were the most amazing part of the dish. I haven’t cooked with them very often as I mostly add them to crackers and breads, but it was such a surprising hit of flavour that complimented the delicate vegetables very well. The feta cheese is a totally optional ingredient, but one I would recommend to those that eat goat and sheep diary. 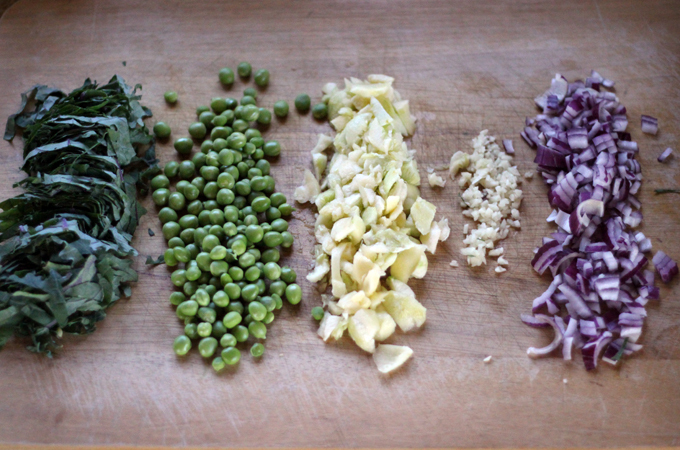 The saltiness balances out the sweet cooked onions and bright pop of peas. If you can’t get your hands on patty pans, any summer squash will do. Zucchini is always available, so in that case, slice the squash length-wise, scoop out most of the flesh in the center to make a boat in both halves, fill them with the vegetable mixture, and place the halves back together again. Perfect! I actually made this dish a couple weeks ago, just before heading off to teach in New York City. It was absolutely amazing. Thanks to Sous Style for hosting me and all the people who came out to learn and share a meal. I will post some pictures soon! Looking forward to the classes tomorrow and Friday here in Toronto. It’s a packed summer of sharing the love! I am bursting! I would like to print this recipe but not all the pictures, any idea how. Hi Jan, we’ve edited the post so you can see a print button next to the recipe. This will print without photos.. The presentation is beautiful and recipe. Hoping to get some from my CSA to try these. First recipe I’ve made from your website and it was delicious – and pretty! Sort your wedsite out, its a mess with the text running through everything and unreadable ! I finally found a very usefull webiste, yours, with great recipes, but you need to sort the text out ASAP, it all runs into each other and unreadable ! the text even runs through the photos ! such a shame, very disappointing as I was about to copy the recipes and also recommend friends to your website, so please have it seen to ! I made these over the weekend. So adorable. But,the filling is so yummy. You are right, the caraway is the thing. Tried these wrapped in foil on the grill while grilling London Broil. Amazing! I cannot wait to try this one! Thank you for the beautiful, healthy recipes. I made these over the weekend with some patty pans I found at the local farmer’s market. I used Chevre for the cheese and red chard instead of kale. I also added shiitake mushrooms to the filling. I just wanted to say they were delicious. I loved the use of the squash flesh in the filling. Thanks for the inspiration! Valuable information and excellent post you got here! I would like to thank you for sharing your thoughts and time into the stuff you post!! I love your blog way too much. I was wondering if you’d ever thought about doing something along the lines of a weekly dinner menu? I’d love to try and eat only healthy goodness for a week – but sometimes I find myself with half a bunch of kale left over or something, and struggle to do something new and fun with it the next night. I’d love a week of My New Roots menus! I am going to make these just so I can say “Patty Pan”. Fresh and delicious. Does anyone know of a farmers market in South London? Thanks! Oh wow!!!!!!! 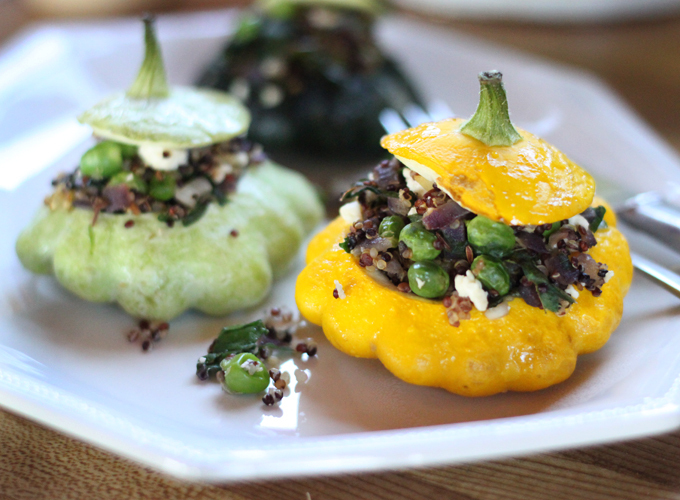 I just made these, I haven’t even roasted the squash yet and I’m eating the filling!!! YUM!!!! Caraway seeds are amazing. Thanks for this. It’s so nice to find new ways with such simple ingredients. This is such a beautiful looking dish. The presentation can’t get much better than that and the stuffing sounds excellent. I’m loving your canisters in the background. Are those vintage? love saying the word patty pan! Looks delicious!! Gives me an idea to stuff my tomatoes since I have way too many from the garden!! You seriously just solved a garden mystery! We got one of those little patypans and weren’t sure if it was ornamental, edible or from outerspace. Thank you and I certainly will be trying this recipe though I may have to look for some more squash! This recipe looks absolutely delicious and your photography is amazing. I love your use of seasonal, local ingredients. I look forward to reading more of your blog. 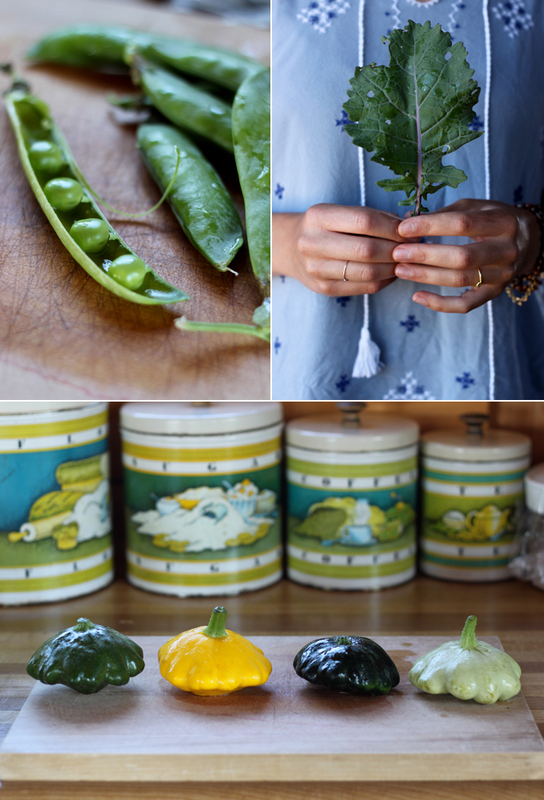 I get fresh pattypan from my csa – my three year old calls them “the flying saucer” squash. I can’t wait to try your version! such a good idea! thanks for the beautiful recipes! I love the idea of “journey” meals. Adds an element of storytelling to the recipe. Thanks for the beautiful pics and lovely recipe – I will pick up a Peter Pan Pattypan Squash the next time I see them, for sure! 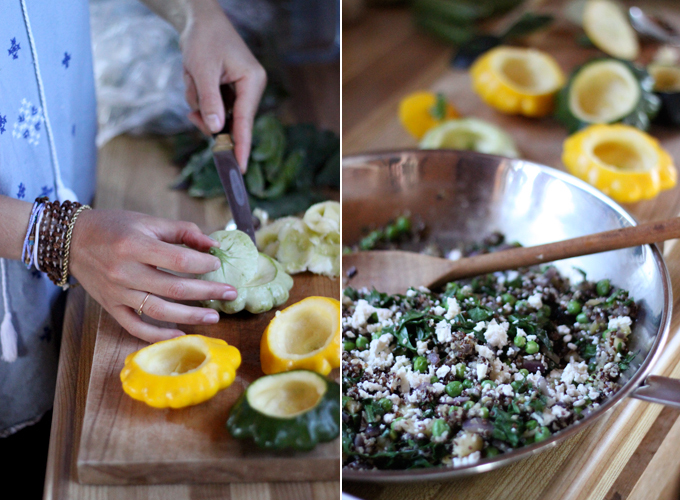 Oh patty pans are so cute and I think your stuffing looks fresh and nourishing. The only time I’ve seen patty pans is once at CostCo. (Should definitely visit farmer markets more often) They were so cute that I picked up a bag but my meal did end up being very tasty 🙁 Will have to give your recipe a try. Love that they also have quinoa in them! The markets are so glorious now and my garden is flourishing beyond anything I could have imagined; which makes for many meals with stories. Cooking and eating in th summe is ever so easy; I wish I could bottle the feeling I have for summe produce- id sell it and make a mint! Beautiful! Love all the greens with the red(purple!) cabbage. I love patty pans just for their name and their adorable miniature-ness helps too. This looks delicious. Especially the caraway addition. Love that. dear smile-bringer Sarah, I am reading this colourful blog and I am smiling, like non-stop, the colours, the veggies, your love to food: thanks for it all! sunny hug from tulipland+merci b for this shared yumminess+thanks for having you online!